In light of the unbelievable disaster that is happening in the Gulf of Mexico - to the PEOPLE, WILDLIFE, and FUTURE of the viability and health of that vast region, it is even more imperative that we get serious and fight for CLIMATE JUSTICE for all! IEN has been committed to environmental, economic and social justice issues for 20 YEARS! Please join with and help us to continue our work with a donation, participating in actions and events, and voice your opinions whenever possible to those in power to ensure a clean and healthy future for all! YES - IEN is celebrating its 20th Anniversary! and we will have limited edtion IEN Anniversary T-Shirts available at the USSF for $20.00 - stop by our table or at the FUND-raiser on Thursday! Clayton Thomas-Mueller, IEN's Canadian Indigenous Tar Sands Organizer, will be one of the featured speakers at the Council of Canadians at Shout Out for Global Justice at Massey Hall in Toronto on June 25. If you are in or near Toronto, join Clayton, along with Maude Barlow, Naomi Klien, Amy Goodman, John Hilary and others... scroll down to the speakers list w/bios and more information. Join the Defenders of the Land for a day of action on Indigenous rights. 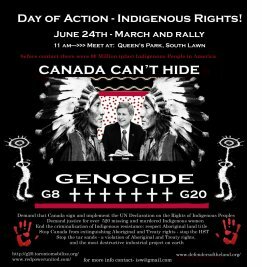 Defenders of the Land will be hosting a mass action in Toronto on June 24, to be planned in cooperation with IEN, and other Indigenous and supporter groups. We've included two articles with interviews with IEN's Marty Cobenais' as he joins forces with a growing coalition of conservationists calling for Montana to block ExxonMobil's proposed high-and-wide corridor through the state. Faith Gemmill, from REDOIL (Resisting Environmental Destruction on Indigenous Lands), and who has lived with the effects along with thousands of other Indigenous Peoples in Alaska from the Exxon Valdez spill. Faith traveled with a delegation from Alaska to Louisiana where they shared their experiences and lasting effects of the Valdez oil spill and talked about dealing with spills with the people of Pointe Aux Chenes Indian Tribe of Louisiana. T he United States has finally agreed to review the UN Declaration on the Rights of Indigenous Peoples - they are also asking for public input during the U.S. review - we've included the information and link below for you to add your voice. Please take a few minutes to support Indigenous Peoples worldwide. We'd also like you to share this newsletter with your friends, family, collegues by using the links provided above the banner and in the footer. Also, visit our website - and click here to: JOIN US on FACEBOOK! The US Social Forum is happening from June 22nd - 26th in Downtown Detroit. Main activities span from Cobo Hall to Wayne State University and many other venues. We are expecting 20 000 participants for the US Social Forum. The US Social Forum is an "open space," which means everyone is invited to share, network, build, debate and create solutions to build another US. What does that mean? You're invited to participate and bring your issues facing your community, your solutions and work to build a US movement that reflects our vision for how we want the world to be. Why should Indigenous Peoples participate? We are the original Peoples, the US is our homelands. Any "movement" should be lead by Indigenous Peoples. Our people represent the vast oppression, genocide and other attrocities that happened to create the US as we know today. We also represent the survival and vitality of a people that cannot be defeated. Our strength in surviving 500 years of oppression is our gift to the movement through healing, diversity and the deep spiritual ties our people have to our sacred homelands. Whats happening? 1000 workshops, 50 Peoples Movement Assemblies, cultural performance, work brigades, murals, debates, plenaries, parties, and so much more. How can I get involved? For more information we have a web-site at http://www.ussf2010.org that has the newly printed program, info on logistics, events, workshops and other related activities. There are registration fees to attend. They are based on a sliding scale, so if you can't afford a large contribution we can work it out! The First US Social Forum happened in Atlanta, Geogia in 2007. Many different Indigenous groups attended. We create an Indigenous Declaration that gave the movement a clear message on what is happening in Indian country, how to support Indigenous struggles in their work and why working with Indigenous Peoples is important. We had many different events and were hosted by the Eastern Band of Cherokees from North Carolina. This year, again we are asking all Indigenous Peoples to attend! Bring your issues, your polictical asks, your solutions to share with other Indigenous Peoples and the movement at large. Whats happening for Indigenous Peoples specifically? A whole lot of activities, meetings, events including a water ceremony and a pow-wow! Opening March- On Tuesday June 22nd there will be an Opening March. We are inviting Indigenous Peoples to lead the march. A local drum and local people from the Detroit region will host us during the USSF and leading us during the March. We will be meeting up at 1pm at Hanock and Woodward. From there we will make our way down Woodward to the Cobo Arena. Once we arrive we will be welcomed by Indigenous Singers and dancers, as well as Africian dancers and singers. Opening Ceremonies- After the March at around 5pm (depending on the length of the march) there will be an elder from the Detroit area giving an offical welcome to the overall US Social Forum. The Opening Ceremonies will begin with speakers and performers for a great show after a long march. First thing the morning at the Social Forum Village you are invited to attend a Water Ceremony. All peoples have been invited to celebrate and pray for the water. We've asked everyone to bring water from their homelands. It doesn't matter if you bring tap water, lake water, contaminated water! Local women from the Detroit region will be leading the water ceremony. The Social Forum vilage is located about a mile from Cobo hall along the water front. We will have an Indigenous Tent set-up at the village. We will be meeting at the Social Forum Village at 8:30 am before the workshops start for the day! Early morning for some but will be a great way to start off the US Social Forum activities. During the Social Forum there will a be a Children's Social Forum for children 5-12 ages. We had a Childrens Social Forum in Atlanta and it was well received by parents and children. There is also child-care provided for children under five. Both the Children's Social Forum and Child-care require folks to register on the web-site! If workshops aren't your thing, there is an art space in cobo hall to help create visuals for the march and other amazing things during the social forum. There are also work brigades happening daily to build Detroit and leave something good behind when we all go home. THere is a film festival going on too. Daily performances at Hart Plaza located beside Cobo Hall! In the afternoons from 1pm to 5pm there will be Peoples Movement Assemblies. The idea is to bring together people working on specific issues like poverty, or climate change; to strategize, build together and develop a resolution that anyone at the US Social Forum could sign on too. Our hope is that the PMA's create actions for the year and help folks build new alliances. There will be a PMA on Wednesday for the Tar Sands- largest human industrial project on earth! There will be Indigenous peoples from Northern Alberta, Alaska, Oklahoma, Minnesota participating in this event. More information is available on the web-site. Wednesday Evening we are inviting Indigenous peoples to come out to the American Indian Health Services. We wanted to provide a social event for visitors to the local Detroit Native community. We will be meeting at the front of Cobo Hall the main entrance by the bus loop for 5:30pm. We will head down to American Indian Health Services at 4480 Lawndale Street for a 6pm arrival. We will have a meal together and enjoy meeting each other. Tom Goldtooth of the Indigenous Environmental Network will be our MC for the evening. We wanted to provide space for folks to meet and have an open mic to introduce themselves! We will head back to Cobo Hall for 9pm so folks can enjoy evening activities or go home and rest for the night. We wanted to provide space before the activities of the day for Indigenous Peoples to meet and brief together. We will be providing a space daily at Cobo Hall for an Indigenous People Caucus for 1 hour. The room has not been assigned yet! We would be meeting from 9am to 10am roughly before the workshops start. The idea is to welcome each other daily, if folks have opportunities to share them, as well as events, and if there are problems for us to figure them out! Again from 10am- 5pm daily we are hosting 1000 workshops over three days. So look for the printed program on the web-site to check out what workshops you want to attend. There will be a PMA for Indigenous Peoples from 1pm to 5pm. We are asking folks to attend bringing their issues, solutions and resolutions from their communities. This space is provided to build a resolution from Indigenous Peoples to the larger movement. We are hoping to include your issues and to give folks concrete ways to support Indigenous Peoples in their work and day to day lives. Thursday we will be showcasing the Haudausaunee Singers and Dancers from 3-5pm in Hart Plaza beside Cobo Hall. They are travelling from Syracruse to perform. At Hart Plaza daily there will be performances daily! We are showcasing: John Trudell, Daygots Leeyos, Joe Riley, Annie Humphrey, 20/20, Philip Meshekey and many more! For more information on performances there will be a flyer in the program books given out when you register! John Trudell will be performing at Hart Plaza in the evening and showing his film at the film festival on Thursday. 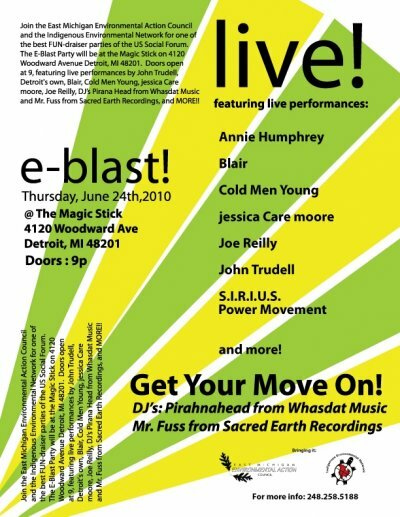 Thursday evening, the Indigenous Environmental Networking is throwing a fund-raiser party at the Majic Stick 4120 Woodward Ave until 2am. Tickets are ten dollars at the door! Please come out and show your support. John Trudell will be performing and many of our Indigenous Talent attending the USSF. Morning Indigenous Peoples Causcus at Cobo Hall from 9am to 10am before the workshops start. Again, we don't have the room figured out yet but will soon! Be on the look out for updates! Workshops, PMA's, and all kinds of activities today. Incinerator Alternatives, Alliance for Democracy, ShaleShock Action Alliance, Mountain Justice, Southern Tier Advocacy & Mitigation Project (STAMP), Southwest Workers Union, Mothers on the Move, Women of Color United, Just Transition Alliance, Environmental Justice Climate Change Initiative, Global Justice Ecology Project, and more. We hope that from the Indigenous Peoples PMA the day before that we will have a synthesis team working to put together and finalize our resolution and statement for Saturdays All Peoples Movement Assembly! Where we will hear back from all 50 PMA's so we can support each other's work! Those folks coming from oil and gas impacted communities are invited to attend a community tour out the Marathon refinery. We are working on providing transportation to the community for the tour. We haven't finalized a time or space yet but will let you know. The local community group that lives with the Marathon Refinery called 48217 have extended an invitation to Indigenous Peoples to tour their community and meet with them at one of the local community centers. We will send out more information as we have it for folks. Friday evening, there is a huge party happening called the Leftist Lounge. One of our Indigenous DJ's from Oklahoma- Marty Aranaydo will be DJing this event. There will be different rooms playing different music. We are expecting 8000 people to come through this party! Indigenous Caucus meeting from 9am to 10am in Cobo Hall for updates and information. The Detroit Healing Walk is happening this day. Folks will meet at 9:30am at Cobo Hall to get transported to Fort Wayne. Located at Fort Wayne is a burial site of the local Indigenous Peoples. We will be going out to the site to do ceremony. We will then commence a five mile walk to heal ourselves and share with each other. On the route of the walk we will stop for refreshments meeting back at Fort Wayne for a closing ceremony at around 4pm. We will then provide transportation for people to come back to Cobo Hall. 9am on Saturday, folks are organizing an action and march at the local Detroit Incinerator (one of the largest in the country)! We are inviting Indigenous Peoples impacted by dirty energy to come and participate! From 12 noon to 5pm the All Peoples Assembly will happen to provide space to bring together all the PMA's that happened and to report back the resolutions, actions and endorsements that folks developed. From 5pm we will have a closing ceremony! ♦ SHOUT OUT FOR GLOBAL JUSTICE!!!! 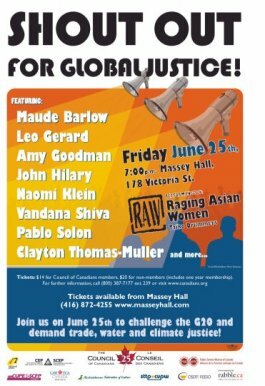 On June 25, please join the Council of Canadians at Shout Out for Global Justice at Massey Hall in Toronto. NOW magazine calls the event a 'resistance highlight' confronting the G8/20 meetings in June.The event will feature global social justice speakers to challenge the G20 and demand trade, water and climate justice! This event will be broadcast live to the US Social Forum in Detroit, Michigan. Looking forward to seeing you! For further information, call (800) 387-7177 ext. 239 or visit www.canadians.org/g20/event.html. Help us outreach for the event! Download handbills for the Shout Out for Global Justice here. Read the Council of Canadians media release announcing the event here. On June 25, please join the Council of Canadians to challenge the G20 and demand trade, water and climate justice! Friday June 25th, 7:00p.m., Doors at 6:00p.m. Tickets: $14 for Council of Canadians members, $20 for non-members (incl. 1 year membership). Get your tickets fast! Maude Barlow, national chairperson of the Council of Canadians and chairs the board of Washington-based Food and Water Watch. Leo Gerard, International President of the United Steelworkers and Vice-President of the AFL-CIO. Amy Goodman, host and executive producer of Democracy Now! a national, daily, independent, award-winning news program airing on over 800 TV and radio stations in North America. John Hilary, executive director of War on Want , which campaigns for human rights and against the root causes of global poverty, inequality and injustice. Naomi Klein, award-winning journalist, syndicated columnist and author of the international bestsellers, The Shock Doctrine: The Rise of Disaster Capitalism and No Logo: Taking Aim at the Brand Bullies. Dr. Vandana Shiva, founder of Navdanya, an environmental justice organization that counts 5,000,000 farmer families in sixteen states of India among its members. Before becoming an activist, Dr. Shiva was one of India's leading physicists. Pablo Solon, Bolivian ambassador to the United Nations and lead negotiator for Bolivia at the December 2009 climate conference in Copenhagen. Clayton Thomas-Mueller, aboriginal activist and tar sands campaigner with the Indigenous Environmental Network. When the G8/G20 comes to Canada in June let's tell the world the real story about Canada's record on Indigenous rights: a continued policy that aims to terminate Indian Peoples by removing our land and resource base and denying us the right to self-determination, under the power of the Indian Act and the Department of Indian Affairs. Canada is the only country still opposing the UN Declaration on the Rights of Indigenous Peoples; the other three countries opposed to it have changed their vote or are reconsidering. Canada continues to criminalize Indigenous activists who stand up for Aboriginal and treaty rights - even though these rights have been affirmed by the Canadian constitution and the United Nations Declaration on the Rights of Indigenous Peoples. Canada's policies of dispossession and control continue to create extreme poverty and social distress for Indigenous Nations across Canada. Finally, Canada and the provinces have done nothing to investigate and stop the disappearance and murder of hundreds of Aboriginal women across the country. That is the record on Indigenous rights that lies behind the show of Aboriginal culture that Canada put on at the Olympics, and it is time the whole world came to know it. We reject the G8 and G20 as decision-making bodies. They don't operate on behalf on Indigenous peoples and don’t recognize or respect Aboriginal and treaty rights. The G8 and G20 are implicated in the ongoing colonization and destruction of Indigenous Peoples and their lands. This ongoing colonization in Canada and abroad is based on the racist doctrines of Discovery and terra nullius. Defenders of the Land, a network of Indigenous Nations in land struggle, is calling for June 24, 2010, to be a cross-Canada day of non-violent action focusing on Indigenous rights. on appropriate actions to defend and protect our land, our communities, and our ways of life; it is not intended to do the work of the government by dividing us from one another or labelling each other.Communities should plan and engage in their own actions, and do what is comfortable and appropriate for themselves. Defenders of the Land can offer advice, assist with some coordination and communications, including media work, and may be able to provide some training assistance, depending on capacity. Defenders of the Land does not have capacity to offer legal support, so communities should choose their actions with this clear knowledge and be prepared to take responsibility for follow-up. Defenders of the Land may be able to connect people with offers of legal support, but this depends on availability and cannot be guaranteed. READ/DOWNLOAD the entire statement from the Defenders of the Land here. The Department of State has created a new website to enable public input during the U.S. review of its position on the UN Declaration on the Rights of Indigenous Peoples. On April 20, 2010, United States Permanent Representative to the United Nations Ambassador Susan E. Rice announced at the United Nations Permanent Forum on Indigenous Issues that the United States has decided to review the U.S. position on the Declaration. The Administration recognizes that, for many around the world, this Declaration provides a framework for addressing indigenous issues. During President Obama's first year in office, tribal leaders and interested non-governmental organizations (NGOs) encouraged the United States to reexamine its position on the Declaration - an important recommendation that directly complements our commitment to work together with the international community on the many challenges that indigenous peoples face. http://www.state.gov/s/tribalconsultation/declaration/index.htm. Tribal leaders, NGOs, and others are encouraged to contribute to the review by emailing us at Declaration@state.gov, or by submitting comments via mail to the Department of State at: S/SR Global Intergovernmental Affairs, U.S. Department of State, 2201 C Street N.W., Suite 1317, Washington, D.C. 20520. Written comments are requested by July 15, 2010 to ensure that they can be given due consideration in the review. The marshes here have long been a refuge for the Native Americans living in Louisiana's bayou. PEACE RIVER, ALBERTA--(Marketwire - May 26, 2010) - "We may be a small community, but we carry a big stick", says Chief Donny Testawich of the Duncan's First Nation, one of the many Treaty #8 First Nations located within the tar sands producing areas of northern Alberta. This week, the small Cree community walked into Canada's top court and the Hague Netherlands to take on the Government of Alberta and Royal Dutch Shell over the impacts of tar sands developments and trampling of their Constitutionally protected Rights. The Duncan's First Nation and the Horse Lake First Nation's lawyer presented at the Supreme Court of Canada's hearing in the matter of the Carrier Sekani and Rio Tinto case – a case that will determine how Canada's energy regulators are to deal with the conflict between First Nations' rights and major energy projects such as the Tar Sands. "results based", hands off approach with the tar sands industry. It is clear to us that the emperor is not wearing any clothes. We have nothing to lose at this point but to pick up the stick - our constitutionally protected rights, and take them into Canada's courts." At the same time this week, the Duncan's took action in Europe. A group of Alberta First Nations arranged access to Royal Dutch Shell's AGM in the Hague Netherlands with the assistance of the Indigenous Environmental Network and Friends of the Earth Europe. list of major energy projects that will fuel and make full out Tar Sands expansion realizable. high-and-wide corridor through the state. equipment from South Korea to the Kearl Oil Sands project in Alberta. Accommodating the modules requires about $22 million worth of highway modifications. The company would raise or bury utility lines in 572 locations, modify or install 33 traffic structures, modify or build 75 highway turnouts, and trim dozens of trees in Bonner and Choteau. MDT is expected to decide this month on whether or not to approve the proposal. Cobenais, of the Minnesota-based Indigenous Environmental Network, says the project has the makings of an environmental catastrophe—and that's before the equipment even gets to Alberta, where it will help extract oil from beneath pristine boreal forest. We caught up with Cobenais this week prior to his arrival for a speech about the proposal. Indy: What's happening now at the Alberta tar sands mines? Cobenais: They want to expand. Right now, they are building too many pipelines, so they can't meet production. They're having a hard time even filling up the pipelines that are just now coming online. Plus, they have another Keystone XL Pipeline that they want to create. They want to get more equipment up there. That's why the Missoula corridor is being created, so they can get more equipment up to the tar sands to get more oil out. That's what we're trying to fight. We're trying to stop the expansion. In the end, the tar sands will be equivalent to the size of Florida. Indy: Why is Missoula important in this discussion? Why is it important that Montanans are engaged? happen, it's one of those (trucks) falling into the river. Indy: Northern Rockies Rising Tide and others have accused Montana Gov. Brian Schweitzer of encouraging production of dirty fuel by supporting the high-and-wide corridor. Do you agree? and they will end up having oil spills. Indy: Schweitzer has said that the project, if approved by MDT, will yield approximately $68 million in revenue for the state. That revenue, he says, provides a powerful economic incentive. Do you dispute the potential economic benefits of the proposal? government will say, 'Yes, we can make this money. And we can also create these jobs.' Those are the top two things any government official is going to look at right now. And, unfortunately, the environment loses that fight every time. Indy: I've read that the estimated carbon footprint resulting from oil extraction in the Alberta tar sands could be worse than any other oil extraction project in North America. Is that true? Cobenais: This is going to be the second largest oil area in the world. It's also, unfortunately, the most damaging way of extracting oil. Right now they dig off the whole boreal forest and they dig down about 80 to 100 meters. And they claim to put things back the way they were afterward. But, looking at it, they're not. So, yes, there's a huge carbon footprint. Indy: MDT has said it must comply with state law when deciding whether to approve the shipments. And what we're hearing from MDT is that its scope is limited to just looking at the immediate impacts of the actual corridor itself. The agency is not legally allowed to look any further than that—to look at, for instance, the broader environmental picture. What's your take on this legal rationale? Cobenais: I think that government will find a way to allow it just because that's the government. They know the rules, the ins and outs, just like the oil companies do. Indy: If Montanans don't want to see the corridor constructed or the larger project continue, what can they do to stop it? Cobenais: I think people can still get up and voice their opinions and give strong reasoning for why the governor and the state departments and everyone else should not give these permits...Voices are still heard. If people are against it, they can get out and be active. They can do protests, nonviolently of course, get out and voice their opinions and say no. And if it does happen they can change the leadership. 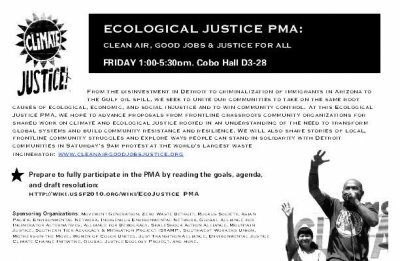 NOTE: this event has taken place - however, the information and interviews are of current interest and an ongoing struggle for environmental and human health justice. To Marty Cobenais, it's like war. "You know the old military strategy of cutting off the supply chain?" Cobenais said by telephone from the Minneapolis-St. Paul airport Tuesday. "Montana is the supply chain." An activist for the Indigenous Environmental Network, Cobenais has agitated for four years against mining the massive tar/oil sands fields in northeastern Alberta. He's one of three people who'll be in Missoula on Wednesday evening to present the ugly side of bitumen mining in Alberta as the "big rig" flap in western Montana shifts to a higher gear and a broader realm. A free screening of the 75-minute documentary "H2Oil" is set for 6 p.m. at the Roxy Theater to kick off what organizers have titled "A Walk Through the Tar Sands." It'll be, according to the group, "a night of firsthand accounts regarding the most destructive industrial project on the face of the planet." Presentations will follow the film by Cobenais, of Minnesota; George Poitras, former chief of the Mikisew Cree First Nation, which is downstream from the oil fields in Alberta; and Simon Reece, a youth from Fort McMurray, Alberta, with the Fort McKay First Nation. purpose, according to Northern Rockies' Rising Tide's website, is "to pressure the MDT and director Jim Lynch to get out of bed with Exxon, conduct a full-scale environmental impact statement, and deny the permits for the tar sands corridor." A community bike ride to the rally will leave from the X's on North Higgins at 11:30 a.m.
And on Saturday, the Grammy Award-winning Indigo Girls will be in Pablo for a panel discussion moderated by Native American activist Winona LaDuke. A number of Native environmental issues will be highlighted, including the impacts of tar sands oil development from the eyes of Eriel Deranger, of Northern Alberta's Athabasca Chipewyan. "Environmental Justice in Montana: Protecting the Land for Future Generations" starts at 1:30 p.m. Saturday at the Johnny Arlee/Victor Charlo Theatre at the Salish Kootenai College. The Montana and Idaho transportation departments are considering a plan by Imperial Oil/ExxonMobil to transport some 200 super-sized modules of processors to the Alberta fields through Idaho and western Montana, including Missoula. There are a number of schemes to stop the "big rigs," which will be trucks, trailers and loads two highway lanes wide and too high to fit under interstate overpasses. Rigs that size require special permits to move on state highways, and so far neither Idaho nor Montana has approved permits for the 200 loads. sands, whether it's heavy-truck hauling in Montana or pipelines that are running through their traditional lands that are coming from the tar sands," George Poitras said Tuesday. Poitras was chief of the Mikisew Cree, the largest of five First Nations directly affected by tar/oil sands mining, from 1999 to 2002. He has traveled internationally to talk about the vast mining project and its effect on his people. "My community downstream from the tar sands project is suffering unusually high rates of rare cancers, cancers that are statistically proven to be caused by petroleum products," Poitras said. The Canadian government continues to deny a link between the cancer and what Poitras says are heavy metals in the river that are infiltrating the food chain, "which we rely on almost entirely." "My message is anybody who's considering benefiting from the tar sands is really compounding our issues and essentially is contributing to the demise of many people in my community who are succumbing to cancer," Poitras said. Cobenais said the Indigenous Environmental Network is taking to the United Nations the fight against the mining of bitumen and also new and proposed pipelines built to transport the oil extract from the mined fields. The tar sands are viewed as a 50-year project that will affect an area the size of Florida. "There are tons and tons of different things that are going on here," he said. "It's going to be important for us to get up there (to Montana) and stop the shipments, and stop the damaging affects that are happening to the people, and the environment and the animals in that area (of Canada)." Is it realistic to expect to stop the shipments? "From the environmental standpoint, I think we can do it in Montana," Cobenais said. "Idaho, I'm not too sure. They're pretty lackadaisical in saying that they only have to have a Department of Transportation making sure there are enough axles under the vehicles." "Let’s clear up some misconceptions about global climate change,” Lara Whitely Binder, of the Climate Impacts Group, told tribal representatives gathered at a climate change adaptation training course. events do not prove, or disprove, climate change. Earth’s climate is changing as a result of human practices – that fact is no longer in dispute. “We are not going to avoid the impacts,” emphasized Binder. It will impact – and in some areas already is – the ecosystems of tribal communities who have relied on the bounty of land and sea for centuries to sustain them. Their forests, rangelands, oceans, freshwater, agriculture, weather; even life itself. USIBELLI: Company began building road to mine site this week. MOOSE CREEK -- With the creek rushing in the foreground and traffic rumbling over Moose Creek bridge in the background, representatives of Chickaloon Village Traditional Council on Thursday said they plan to "do everything we have to do to impede progress of the road, mine and exploration activities" planned by Usibelli Coal Mine Inc. north of Palmer. Usibelli, which mines coal in Healy, is considering mining its Wishbone Hill lease north of Palmer. Company officials estimate the lease holds about 10 million tons of coal, enough to operate a mine for 12 to 20 years and employ 75 to 125 workers. The company this week began building a 2.7-mile road to reach the proposed mine site. It also plans to drill exploratory holes to gather information for a mining feasibility study. If results are favorable, the company could begin production in 2012. But first, Usibelli wants to secure two permits. The company must renew its exploration permit with the state this year. It also wants to renew a 25-year lease of 60 acres of Matanuska-Susitna Borough land. The borough land, adjacent to Mile 56 of the Glenn Highway, is a key access point for the mine. The borough Planning Commission this week recommended that the borough deny the lease. The Mat-Su Assembly, which has final say on whether the lease is issued, will consider the matter Tuesday. Meanwhile, Chickaloon Native Village leaders organized a protest Thursday. They said Moose Creek, which runs next to the proposed mine, is crucial to tribal members' religion and culture. Chickaloon is a federally recognized Ahtna Athabascan tribe. "We hunt for moose for our traditional potlatch and (fish) for salmon here," said Shawna Larson, who helped organize the protest. The argument represents the classic Alaska battle between the desire to develop natural resources such as coal and the desire to keep wild resources, such as salmon and moose, plentiful. For Chickaloon tribal members, the issue is painful and historic. A turn-of-the-century mine was placed atop the Chickaloon village, then located on the Chickaloon River, said Angela Wade, tribal environmental stewardship director. "It's been a history of oppression, depression and almost genocide for us," Wade said. "We were deprived of some of that symbiotic relationship (with the land) that we had." Dah Ah School. Tribal members said they worry about the added traffic, and fear dust from the trucks will cloud the school and endanger children's health. The road also would pass within 150 feet of Wade's back porch. Usibelli spokeswoman Lorali Carter said coal dust from the trucks should not be an issue. The trucks will be covered with tarps and the company plans to haul during the night to avoid dealing with bus traffic. The tribe's concerns go beyond the road. They have spent years restoring salmon habitat along Moose Creek, a waterway impaired when the creek was rerouted to accommodate a 1923 railroad spur. They worry the mine will destroy their gains. "The potential impacts of this coal mine are severe. They will impact the salmon and moose," said Jessica Dryden, fisheries program manager for Chickaloon Village. Usibelli disagrees that the mine will harm moose or Moose Creek. Company officials have tested moose habitat vegetation and say they have a planting mix that the moose will thrive on. Company project manager Rob Brown previously said mining activities will be separated from the creek by an elevation difference, which will preserve creek habitat. "We're here to responsibly develop the resource. We're committed to doing things right," Carter said. "We will continue to listen to the concerns of the residents and do what we can to reasonably accommodate those concerns."